1ST TO DIE: In San Francisco newlyweds are being stalked-and slaughtered. Enter four unforgettable women, all friends...Lindsay, a homicide inspector in the city's police department...Claire, a medical examiner...Jill, an assistant D.A....and Cindy, a reporter who has just started working the crime desk of the San Francisco Chronicle. Joining forces, pooling their talents, courage, and brains, they have one goal. To find, trap, and outwit the most diabolical and terrifying killer ever imagined. 2ND CHANCE: 2ND CHANCE reconvenes the Women's Murder Club. This time, the murders of two African Americans, a little girl and an old woman, bear all the signs of a serial killer for Lindsay Boxer, newly promoted to lieutenant of San Francisco's homicide squad. But there's an odd detail she finds even more disturbing: both victims were related to city cops. A symbol glimpsed at both murder scenes leads to a racist hate group, but the taunting killer strikes again and again, leaving deliberate clues and eluding the police ever more cleverly. In the meantime, each of the women has a personal stake at risk--and the killer knows who they are. 3RD DEGREE: Detective Lindsay Boxer is jogging along a beautiful San Francisco street when a fiery explosion rips through the neighborhood. A town house owned by an Internet millionaire is immediately engulfed in flames, and when Lindsay plunges inside to search for survivors, she finds three people dead. A mysterious message at the scene leaves Lindsay and the San Francisco Police Department completely baffled.Then a prominent businessman is found murdered under bizarre circumstances, with another mysterious message. 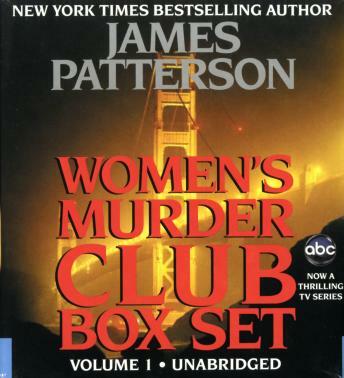 Lindsay asks her friends to help her figure out who is committing these murders-and why they are intent on killing someone every three days.Even more terrifying, the killer has targeted one of the four friends who call themselves the Women's Murder Club.Which one will it be?While the investigation rages furiously, Lindsay works very closely with a federal officer assigned to the case. At the same time, she learns that one member of the Women's Murder Club is hiding a secret so dangerous and unbelievable that it could destroy them all. Agreed with some of the other reviewers- books are great but the narrator for Book 2 was not enjoyable to listen to at all. I love James Patterson. I both read and listen to his books often. I'm on book two of this Club Box Set. The 1st narrator was an amazing reader! I'm struggling, and I mean struggling to listen to book's narrator. She's extremely monotone, which is why I'm scoring so low on the narrator review . The quality of the Patterson novels are not in question! They are great reads. It's the voice of book two that makes me want to throw my phone. Since I paid my way, I'll continue on. Enjoy JP as always!